86% of adults in Madagascar (124th) are in the workforce, and yet the country struggles with some of the worst poverty in the world. The Middle East and North Africa (MENA) region ranks sixth in world prosperity, above only Sub-Saharan Africa; and in spite of ever-increasing wealth, overall prosperity in MENA has declined now for two straight years. The regional picture of prosperity is mixed; Israel was the region’s fastest riser in 2017, due to improving judicial independence and government effectiveness (in Governance), along with a reduction in battlefield deaths and political terror (in Safety and Security). The majority of MENA’s falling prosperity in 2017 was in Safety and Security, with Egypt, Turkey and Libya the worst performers. Within MENA, only Morocco, Oman and Qatar have seen their Safety and Security scores rise in the last five years. 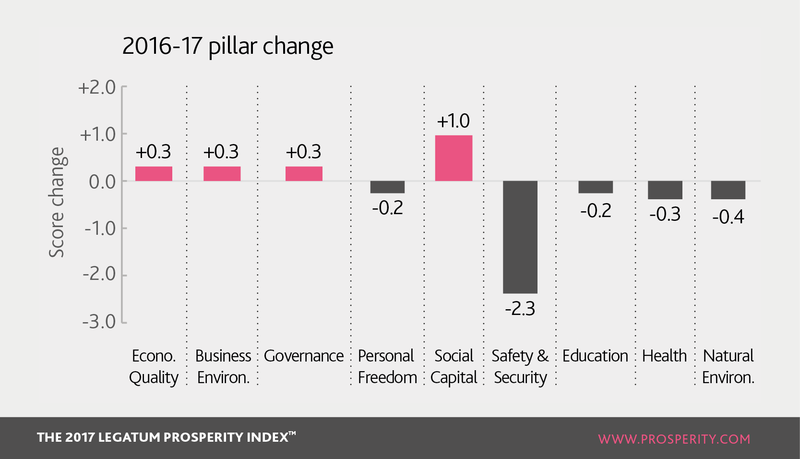 Natural Environment, Education and Health have all improved in MENA over the last decade, yet made losses this year. Personal Freedom remains the pillar in which MENA has the most significant deficit in prosperity. Only Israel at 94th ranks in the global top 100. 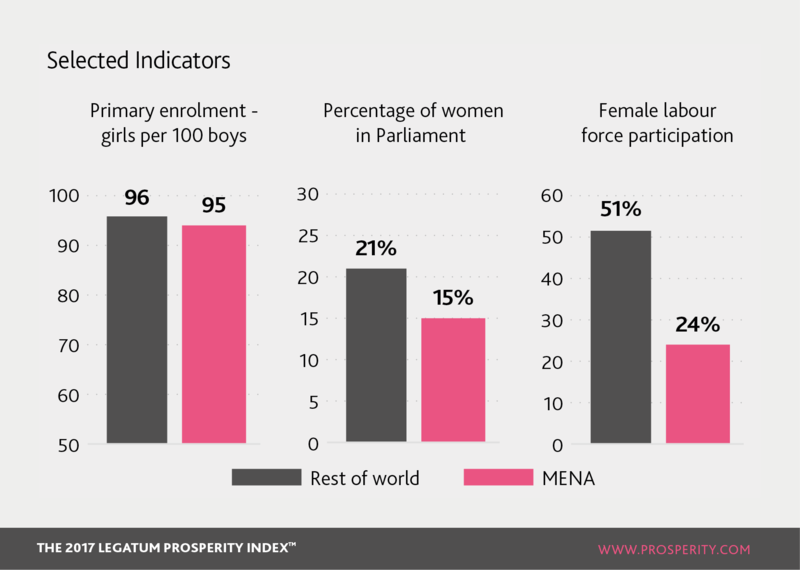 Data from several indicators reflect the fact that women are far less engaged in society in MENA than in the rest of the world. While there is growth in the representation of women in parliament, they are hugely under-represented in the labour force – in 2016 just 24% of female adults in MENA participated in the labour force, compared to 51% in the world as a whole. As well as having an impact on wellbeing, this represents a significant economic drag on the region. Glimmers of change are perhaps on the horizon – for example, a recent landmark ruling in Saudi Arabia has granted women access to driving licences – but there remains a long way to go for women to be fully integrated into the economy. MENA has seen significant growth in the living standards of its citizens. United Arab Emirates (UAE) has seen the greatest increase in standard of living in the world in the last ten years; and there has also been an increase in people’s satisfaction with their standard of living right across into North Africa. However, there are significant challenges across broader dimensions of wealth generation. While the UAE has the third best score in the world for ease of trade, trade in MENA as a whole is still weak and is showing no signs of improvement. The region has by far the world’s lowest levels of labour force engagement. This is especially weak in terms of youth unemployment – the regional level is nearly double the world average. In countries such as Egypt, with a large youth population, this leaves huge numbers of young people without work; and the emerging youth bulge in many parts of the region will only add to this pressure. The existence of state oil revenues is what permits such an imbalance – but as has been illustrated in our previous reports, countries that rely on single commodities for income are generally not successful generators of overall prosperity. 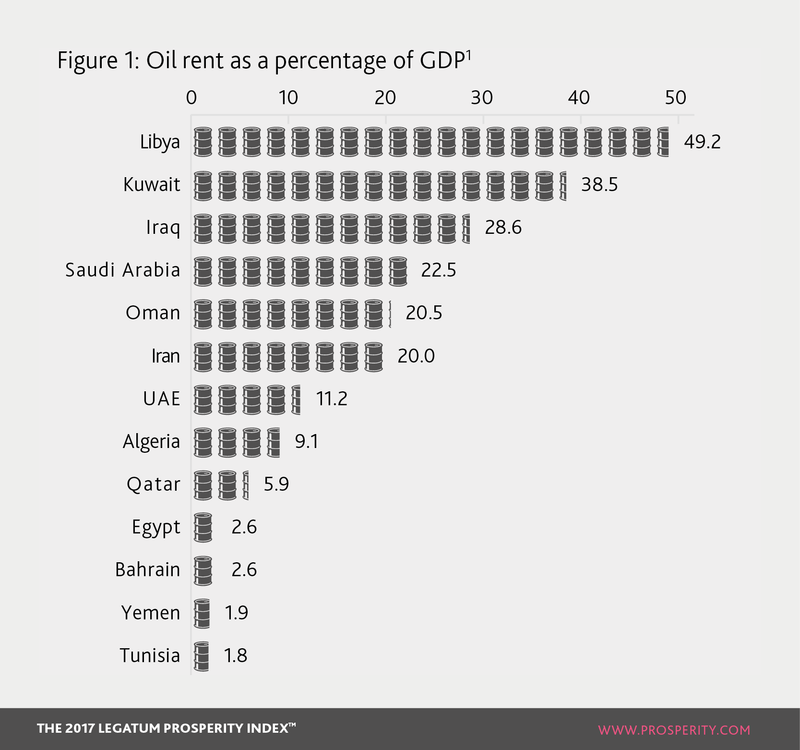 Some nations in MENA, such as Kuwait and Iraq, generate an enormous share of their wealth through oil rent (a measure of a country’s income from oil production, Figure 1) whereas others such as the UAE have reduced this through economic diversification, and have benefited in prosperity terms. 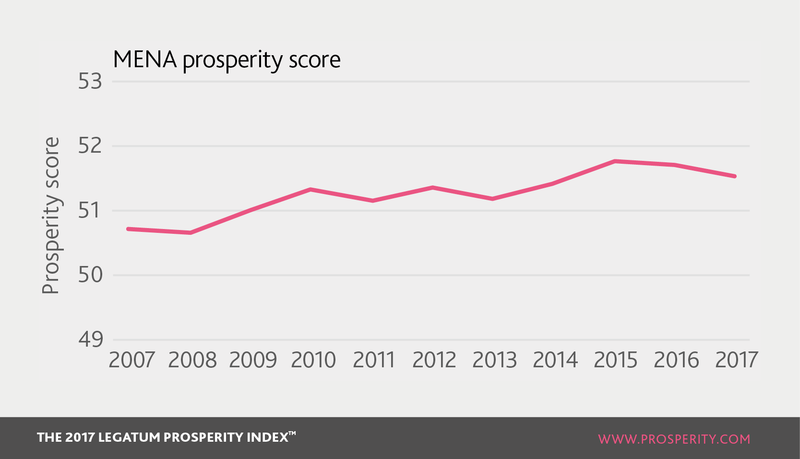 While the UAE may have found a more secure route to prosperity than its oil-rich peers (see the 2016 Prosperity Index), the nation has nonetheless lacked corresponding growth in other indicators of economic performance. The proportion of adults in the labour force has actually fallen slightly in the last five years, while for trade competitiveness (ie the diversity and value of exports) the UAE ranks 97th in the world. A key component of the MENA region’s growing prosperity at the beginning of the last decade was improving Health. Today, MENA performs relatively well – the majority of nations in the region sit above the world average. But in the last six years this upward trend has reversed, and now MENA’s gains are shrinking. So how healthy is MENA? MENA has a distinct fingerprint across measures of Health. On the one hand people live relatively long lives and have good healthcare infrastructure. Qatar is third in the world for satisfaction with healthcare; and the UAE, Bahrain and Saudi Arabia are all in the top 20. But counter to this is the reality that people are generally dissatisfied with life, scoring low in measures of joy and sadness, and also have the worst diabetes and obesity problems in the world. Perceptions don’t seem to match reality – in the Gulf, where obesity is most prevalent, people generally do not perceive themselves as having health issues. Obesity is not only highly prevalent in MENA compared to the rest of the world; data from the World Health Organisation show that it is actually getting worse. And while higher food consumption may be a lifestyle choice to which citizens feel entitled in light of increasing wealth across the region, it has potentially devastating long-term consequences. A 2015 report by Morgan Stanley demonstrated a clear link between the quality of a nation’s diet and its economic growth; and they identify ‘diabesity’ as having serious negative effects on the strength of the workforce, public expenditure and GDP growth. In their projections, economic costs paid by nations suffering from ‘diabesity’ may exceed 30 percent over the next 20 years. At present, it may seem that the region can financially afford to sustain a more consumptive lifestyle without a mobilised labour force. But as the need for productivity increases in future, the costs that have been incurred in health terms through poor diet and lifestyle choices may begin to bite. MENA has undergone a social renaissance over the last five years. Although historically it has had a strong culture of hospitality, its Social Capital has hitherto been weak, with only Eastern Europe scoring lower; and yet in 2017, Social Capital increased more than in any other region. People in the region are now more likely to come to the assistance of strangers than before and are seeing greater opportunities for making friends. Taking Iraq as an example: while its prosperity has been hit hard by the presence of ISIS, Social Capital has improved more than any other pillar over the last five years. Over the same timeframe it has seen a greater increase in Social Capital than any other country. The sense here is that in the midst of violence, Iraqis do not let go of their relationships; rather, they strengthen them. And further west in Libya, strong personal and social relationships have withstood several years of war and terrorism, with citizens now being third-most likely in the world to come to the aid of strangers. However, this deficit is not entrenched in the whole of the region; instead it illuminates some important sub-regional differences. In the Middle East and the Gulf, informal civic engagement within communities is actually improving, with volunteering and donations to charity more frequent in eastern nations such as the UAE and Iran. But at the same time Northern Africa is showing few signs of catching up; and the gap between the east and west of MENA is growing. In terms of more formal civic participation (voicing one’s opinion, turning out to vote) the Gulf states are the exception, falling behind faster than all others (following the political upheaval of the Arab Spring). By contrast, in neighbouring Jordan there are signs of increasing liberalisation, as more and more people feel able to engage politically through voicing their opinion. In short, when considering the whole region, MENA’s growth in Social Capital is hard to characterise. Looking beneath the surface at the individual components of Social Capital reveals a much more varied cultural and political landscape in which change is taking place, as populations build on their unique setting and experiences over the last decade.